Though Mary Walker Phillips is recognized as an American fiber artist responsible for elevating the crafts of knitting and macramé to the realm of fine art, she was first and foremost, a weaver – and a wonderful one at that. This sample from 1960 appears simultaneously structurally precarious and visually charming. It is composed of two intercrossed plain weave structures, known as double cloth. 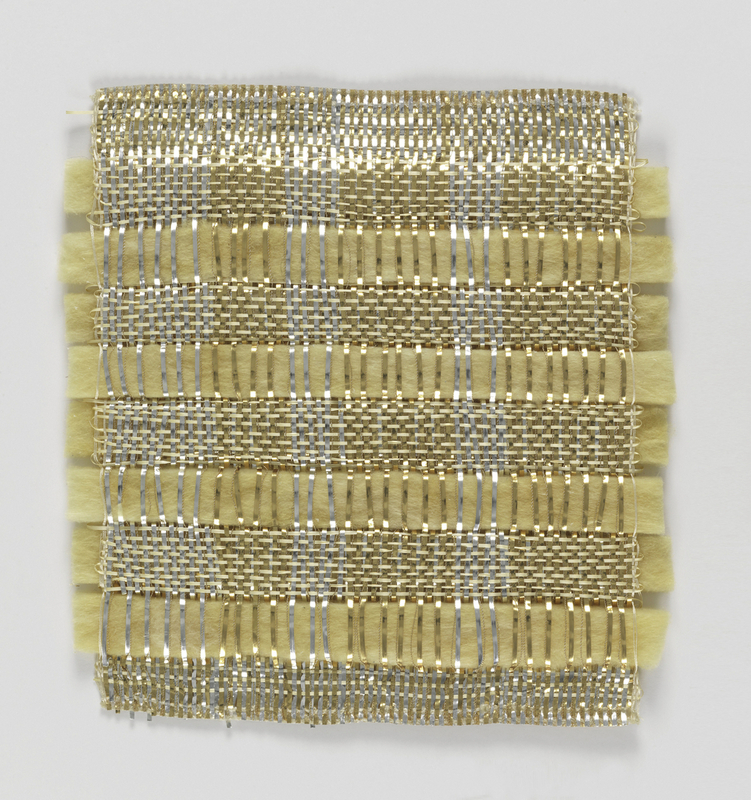 Made of gold and silver lurex, natural fiber, and alternating layers of insulating glass (yikes!) and linen, one begins to understand critics’ accusations of Phillips’ contemporary, Dorothy Liebes, as “weaving with garbage.” Yet, the use of new and innovative materials echoes Phillips’ enduring fascination with experimental textiles, first discovered when she was a student at Cranbrook Academy of Art in Michigan. Today Phillips is regarded as one of the most influential textile artists of the 20th century. Through weaving, knitting, macramé and her influential publications and teaching tenure, she was a champion of not only fiber arts but the development of American studio craft.